Thu., Sept. 25, 2014, 1:51 p.m.
Saturday: Eastern at Cal Davis, 6 p.m.
Tevin McDonald learned at a glance that Cheney looks nothing like Los Angeles. After losing his spot on the UCLA football team following the 2012 season, McDonald looked near and far, then farther yet before finding himself at Eastern Washington. And that was the whole point: If success is a state of mind, McDonald needed to find a new state. It wasn’t easy trading Westwood for the West Plains, forsaking the Rose Bowl for the Red Turf. “That’s something I still battle with, missing that big stage,” said McDonald, a two-year starter for UCLA at free safety and a native Californian who still dreams of following his father and older brother into the National Football League. He’s merely taking a different path, one smoothed for many players by the stability and success of the Eagle program under coach Beau Baldwin. “The Eastern coaches are always thinking of ways to help me excel in this system. Going forward, I’m ready for whatever comes,” McDonald said. While the other 8-year-olds on McDonald’s first football team in Fresno were clamoring to play quarterback or running back, he was already learning the basics of the Cover 4. “Safety, that’s all I ever wanted to play,” said the 6-foot, 200-pound McDonald, whose father Tim was a six-time all-NFL selection and one of only six safeties chosen for the Walter Camp All-Century team. Older brother T.J., also a safety, is in his second year with the St. Louis Rams. Suddenly, McDonald had his own identity. “I was known as Tevin from the moment I stepped on campus,” McDonald said proudly. After redshirting in 2010, McDonald moved up the depth chart after injuries to the other free safeties. He appeared in 14 games, starting the final 11, and was named to Pac-12 all-freshman teams thanks partly to a school-record three interceptions against Cal and a career-high 11 tackles against Arizona State. In 2012, he started in 13 games he played in and ranked third on the team in tackles with 79. McDonald had an interception return for 50 yards versus Houston. He had five tackles Pac-12 title game against Stanford, but was benched for the Holiday Bowl for violating team policies after failing a third drug test. During the crisis, McDonald leaned on family, including his father, now the cornerbacks coach with the New York Jets. “I’m blessed – you couldn’t ask for a better role model,” Tevin said of Tim, an icon in Fresno who capped his playing career by coaching at the same high school (Edison) where his career began in the 1980s. But in the end the next move was up to Tevin. Faced with several choices, he chose Eastern partly because it offered a clean break – “cows and grain versus the beach” – but mostly because of the program’s reputation. At the same time, Baldwin and his staff vetted McDonald all the way back to his high school days, and deemed him worthy of a second chance. “We have high expectations of him off the field, in the classroom and on the field.” Baldwin said at the time. Spring ball already was under way at Eastern when McDonald introduced to the public on a cold April afternoon. Since then, McDonald has rolled up his sleeves and gotten down to work; he’s been almost continuously enrolled since he arrived, and is on target to receive his bachelor’s degree this term in race and culture studies. On the field, the self-described film junkie impressed players and coaches with the breadth of his football knowledge, all with nary a trace of arrogance. “Last year, he was still figuring out the lay of the land,” Baldwin said. That included measuring the quality of Big Sky Conference football, which he appreciated in his first game as an Eagle. Last year at Oregon State, the Eagles pulled off what McDonald’s old UCLA team couldn’t do: beat the Beavers. 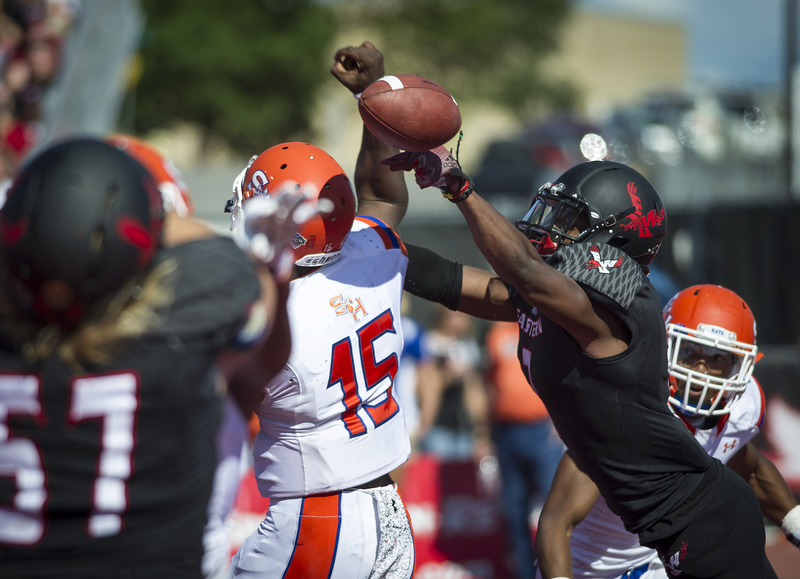 Beyond the 49-46 score, he was impressed by the team’s resilience as the Beavers took the lead while EWU quarterback Vernon Adams was being treated for cramps. Part of the reason: adversity. “It might be because of the close quarters,” joked McDonald, citing the 8-hour bus rides to Corvallis and Bozeman, which are unknown in the Pac-12. “I’ve been on a lot of teams that would not have found a way to win that game, and that speaks to the mindset around here,” said McDonald. His own mindset was severely tested after a catastrophic injury last October at Idaho State; he suffered a broken fibula and an ankle injury in his left leg, an injury that didn’t fully heal until summer. “That was one of the most challenging things I’ve ever been through, but I’m 100 percent now,” McDonald said. For McDonald, the 2014 season got off to a great start even before it began; he was named a senior captain, a rarity for a transfer. “That says a lot about his tremendous influence on this team,” said Baldwin, adding that McDonald has made tremendous strides on and off the field since last season. His football skills were on full display last weekend in Bozeman, where he forced two first-half fumbles to help the Eagles overcome an early two-score deficit. In the fourth quarter, his diving tackle on MSU running back Anthony Knight on fourth-and-2 shifted momentum back to Eastern in a game the Eagles would go on to win 52-51. Published: Sept. 25, 2014, 1:51 p.m.